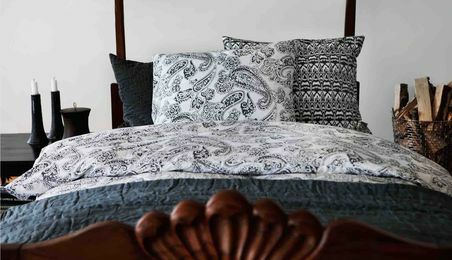 Beautiful collections of matching bedding in Paisley Boho styles, bold Ikat pattern bedding, and cool natural Linen, Buy Single, Double, King and Super King bedding sizes. A Bold Ikat Designed Percale Duvet cover & Pillow case set by Nomads,in a "Panthera" style of Black on White,reversible with Nordic Cross pattern on rear. Pillowcases are now included. Classic Bohemian themed Percale Duvet cover, with a large flower motif (Sundara) with reversible smaller motif design on rear. Pillowcase set now included. Ikat grey ZigZag duvet set by Chhatwal & Jonsson of Sweden.Includes two Pillowcases. 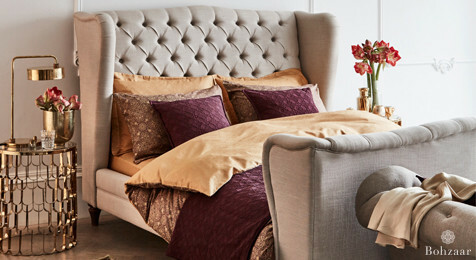 Classic Byzantium themed Gold & Plum jacquard duvet cover, with a repeat pattern on front side, and alternative pattern on rear. Old Paisley duvet set by Chhatwal & Jonsson. Includes two Pillowcases. 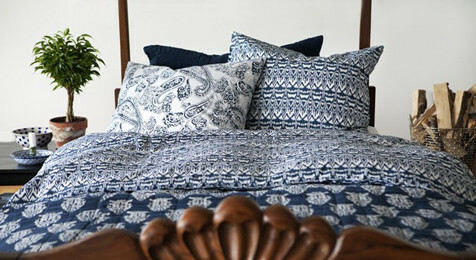 Ikat Urban Blue Duvet set from Chhatwall & Jonsson, in an organic cotton.Includes two Pillowcases.